Do you still have nightmares about those cold mornings when you were sent outside to clear the snow away from your driveway with a horrible shovel? Luckily a couple of big things have happened since those terrible days when you were taught the true meaning of earning every penny of your pocket money. There are now unbelievable snow blowers that will do all of the work for you, but more importantly you’re grown up and now have the cash available to purchase one. Before you spend anything we’re going to look at the most important things you should consider when looking for your perfect Briggs and Stratton snow blower. Introducing Mr. Briggs and Mr. Stratton! I love the design of these old engines. They’re beautiful. Briggs & Stratton (BASCO) was founded in Milwaukee, Wisconsin in 1908. Ever since that day they’ve been developing and refining their small engine designs, as well as optimizing their own power equipment, including snow blowers. When automobiles were entering the mainstream, Stephen Briggs, an electrical engineer and Harold Stratton, a grain merchant, both united and built a gas-powered vehicle. This was just the beginning of a magnificent company that continues to dominate the market in the 21st century. As you’ll see in this article, Briggs and Stratton is a company that knows how to engineer snow blowers for people who value quality. Did you know that Briggs and Stratton is the world’s largest manufacturer of air-cooled gasoline engines for outdoor power equipment. On average, they manufacture 10 million engines per year (as of April, 2015). Built to handle Mother Nature’s toughest weather, Briggs & Stratton snow blowers are equipped with the power and features to move snow quickly and effortlessly. Great features such as Briggs & Stratton Snow Series engine, push button chute rotation and dual trigger steering. We don’t all live in beautiful mansions with an abundance of space, and if you did I’m sure you would hire someone to clear your garden of snow anyway. That means you could live in a home with narrow areas a snow blower might not be able to touch depending on how wide it is. Your typical snowblower might be around 18 to 24 inches wide, but they can go all the way up to 40 inches and beyond, so it makes sense to quickly measure the narrowest parts of areas you plan on using it before you pull the trigger and buy one, unless you still have your old shovel handy. Can throw snow up to 40 feet. If you ride through a gravel path on a dirt bike someone could get a nice handful of stones thrown into their face. The same thing will happen if you try to use a snowblower with single-stage power on anything other than a paved surface. They’re designed to touch the ground and pick up any loose objects in their path, and they’ll fire them out everywhere. Two-stage snow blowers go through a two-step process when firing out the snow and they’ll prevent anything dangerous from rocketing through the air. If there is anything as archaic as the snow shovel, it’s definitely the snow blower you had to wrestle with as you made your way down the driveway. If it wasn’t causing you to build huge muscles because it was too heavy to push, it was improving your agility as it changed direction after hitting a bit of ice. The snow blowers you can buy today should not only stay on a straight path unless you decide to change direction, but they should be built to easily maneuver around without too much difficulty. A self-propelled snow blower will be easy to maneuver in deep snow. This ties in with what we’ve just talked about, but because two-stage snow blowers are self-propelled we can go a stage further. Rather than just being able to propel itself forwards, you should look for a snow blower where you can decide how fast it should go. The best ones will have the ability to change speeds whether you’re moving forwards or reversing. When you can change the speed it truly will be under your control, and you’ll notice you use this feature more than you would have guessed. We talked about why single-stage snow blowers will offer you less protection than two-stage models, but when using the latter the snow still has to go somewhere. It would be much safer and beneficial if you have full control of the chute on either one. Not only will the best snow blowers let you change the direction of the chute, but they will also leave you in complete control of how high the snow shoots into the air and the distance it travels. Safety considerations aside, you’ll also end up with happier neighbors. Can start in temperatures as low as -20◦ Fahrenheit. Depending on where you live, you might not see a lot of heavy snowfall. If you live in an area where you can expect an average of 8-inches of snow you’ll be able to use a single-stage snow blower quite easily. Anything more and you will really need a two-stage snow blower otherwise you’ll never be able to get rid of it all. If the snow is usually wet and heavy you’ll also benefit from the two-stage model, because although the single-stage snow blower might be able to deal with the amount of snow, it’s going to make your life a lot easier. During the winter months there isn’t a great deal of daylight hours, which could pose a problem for anyone who leaves for work early in the morning and doesn’t get home until it’s dark. You will have to get rid of the snow at some point, or it will get to the stage where you can’t move. It could be very beneficial if you look for a snow blower with headlights, because even though it’s still not as easy as clearing the snow when it’s light you will still be able to see the controls and where you’re going. A headlight comes in handy if you’re clearing snow at 5am. As you already know if you drive any type of vehicle, an engine is a lot harder to start when it’s freezing cold. You will only need to use your snow blower in freezing conditions, therefore you will want to purchase one with the ability to start as smoothly as possible no matter how cold it is outside. All of the best snow blowers will be capable of starting easily when it’s well below freezing, and the best ones will have a push button electric start to make it effortless on your part. You won’t be able to find anything better than a Briggs and Stratton snow blower, but there are so many brands on the market today so you’re probably asking yourself why. Even though you’ve maybe never heard their name being mentioned before it’s likely you’ve still came into contact with them over the years. 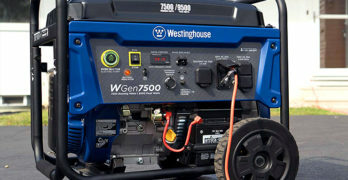 In fact, considering their engines have powered a wide range of outdoor power equipment for over a hundred years it’s likely you’ve owned one before. The weather is always unpredictable. It’s best to plan for the worst. At the time of writing, 9 out of the top 10 leading lawn mower brands are using Briggs and Stratton engines to power their most popular models. Their products can also be found in things like electric refrigerators and paper towel dispensing machines, but now they’ve propelled themselves into the limelight with their wildly-popular products including snow blowers. We’re going to look at a few of their top Briggs and Stratton snow blower models, along with some of the features that make them stand out. When you buy a snow blower, you expect it to start when the temperature dips. Snow blowers cost a lot of money so I’m guessing you’d be rather upset if it failed you when you needed it most. Well, as stated earlier, Briggs and Stratton has been making engines for over 100 years. Their motors are as reliable as you can get. Nothing in this world is perfect, but you can rely on a Briggs and Stratton snow blower. Even when the weather conditions are harsh and difficult, these engines are engineered to start at temperatures as low as -20°F. They are designed to be affordable and dependable, especially during those cold winter mornings, not to mention the ability to deliver the power you need to move thick, heavy snow. These Briggs and Stratton snow throwers can easily tackle a light dusting of snow or the winter’s worst storm. Some assembly required — but it’s worth it. This powerful 208cc two-stage Briggs and Stratton snow blower will be able to help you power through almost anything Mother Nature decides to throw at you. It will fit into places greater than 24-inches in width, so it’s small enough to fit into tighter spaces the other medium-duty model we’re going to look at won’t be able to. It comes equipped with over-sized controls to allow you to keep your gloves on while being able to do everything with it. The friction disc drive transmission will allow it to propel itself on its own, which makes it much easier if you have to use it on slopes. It has 5 forward and 2 reverse speeds to help you move it around. The push button electric start will work even if the temperature is 20 degrees below zero. There is also an integrated LED headlight built into the controls to help you see them better when visibility is not great. One such button you’ll be able to see is the chute rotation control, which will allow you to switch the direction of the chute between left and right. Its trademarked free hand control will let you steer the snow blower with one hand so the other is able to change any settings on the control panel. Like every Briggs and Stratton snow blower; its frame, chute, and auger is created with heavy-duty steel that will last for years. **Capacity and throwing distances are affected by weather and snow conditions, so please factor that in when reading specific snow throwing specs. This is true for all snow blowers. I know, it’s common sense, but some consumers don’t consider the weight of the snow (wet vs light and fluffy) and wind conditions. Heavy duty construction will endure over the years. Briggs & Stratton 950 Snow Series Engine: Specially designed to start immediately (as low as 20 degrees below zero) and power through in the toughest winter conditions. Over-sized controls provide mitten-friendly operation. Free Hand Control offers one-handed operation of the snowblower, allowing you a free hand to rotate the chute or adjust the speed. Manual Chute Rotation : Chute rotation control is located on the control panel. You can easily (and quickly) adjust the direction the snow from left-to-right. LED headlight is integrated into the front panel making it easy to see when it’s dark. Push Button Electric Start: Offers quick and easy starting, even when it’s freezing cold. Friction Disc Drive Transmission: This is a self-propelled snowblower with five forward and two reverse speeds. This is a beast for the toughest snow storms. Briggs & Stratton 950 Snow Series Engine: Specially designed to start strong (down to 20 degrees below zero) and power through in the toughest winter conditions. The 250cc model is slightly more powerful than the last medium-duty Briggs and Stratton snow blower we looked at, so if you live in an area with a lot of snowfall it might be worth going for the extra power. The biggest difference between them is the amount of snow they can displace width-wise, with the 1696619 model coming in at 27-inches in width. For some people this will be a blessing in disguise, but for others it could become a problem because of their home. If there are any areas in your garden where the 27-inches wide snow blower won’t fit it’s a problem, but because it’s 3-inches wider it means you’ll be able to clear a lot more snow in a quicker amount of time. It could also mean the difference between clearing a garden path in one swoop versus having to turn around and go back the way you came to finish it off. Even if your path is wider than 27-inches it’s still easy to clear the snow without much hassle. That is because it’s got the same self-propelled capabilities thanks to the friction disc drive transmission, and it comes with the same 5 forward and 2 reverse speeds. You’ll also get the LED headlight, free hand control, manual chute rotation, and a push button electric start switch with the ability to handle temperatures up to 20 degrees below zero. It’s perfect for anyone who wants extra power and a wider reach. Designed to clear snow up to 12″ deep. Briggs & Stratton 750 Snow Series Engine. Electric Push Button Start: Push button electric starting makes for quick and easy starts. Auger-Assist Drive System :The wear-resistant rubber edged auger cleans snow down to the pavement and helps propel the snow blower forward. Compact Size: More maneuverable and easier to control size – plus it saves space in your garage or shed. Although this 163cc Briggs and Stratton snow blower is only a single-stage model, it’s still got enough power under the hood to clear up to 12-inches of light snow. Considering a lot of single-stage snow blowers can only handle around 8-inches of snow, those extra inches could come in very handy when you’re deciding which one to buy. The only downside is the fact it’s more suitable to light snow, but it might not matter depending on where you live. Ideal for snow up to 12-inches. Better for Seattle than New York. It still comes with the easy-to-use over-sized controls to allow you full use of its features without taking your gloves off, and this one has a chute-mounted rotation handle to make it easier for you to switch the direction of the chute within seconds. The quick-adjust chute deflector also means with a simple squeeze of the chute-mounted rotation handle you can change the height and distance the snow flies out of the chute. We talked earlier about single-stage snow blowers coming into contact with the ground and you’ll get an auger-assist drive system to help with this, which means the auger will have wear-resistant rubber edges to help drive it forward. Even though it won’t be able to propel itself forward on its own you’ll still get a little help in that department. It’s also only 22-inches wide, so it will fit in places the two-stage snow blowers won’t be able to go. Serrated auger will cut through hard packed snow at the end of your driveway. SnowShredder Serrated Auger: Easily clears more heavy and wet snow in less time with a patent-pending SnowShredder Serrated Auger. Fourteen serrated surfaces provide advanced ice chopping and snow clearing power. Electric Chute Rotation: Easily change the direction the snow is thrown with the push of a button. Self-Propelled Auger Drive System: The self-propelled auger clears down to the pavement with little effort and helps propel the unit forward. Dual incandescent headlights are integrated into the controls and provide better visibility. Briggs & Stratton 1150 Snow Series Engine. Push Button Electric Start: Push button start offers quick and easy starting, down to 20 degrees below zero. Compact Size: This snow blower is very maneuverable and easy to control. Fits easily in your garage or shed. Quick-Adjust Deflector: Easily change the height and distance snow is thrown with a simple squeeze of the chute mounted handle. The 250cc Briggs and Stratton snow blower is not only more powerful than the last single-stage model we looked at, but it also comes with a lot of additional features. It’s got an integrated incandescent headlight to provide you with extra visibility and it will allow you to see the controls a lot easier. The electric chute rotation on the improved model will let you change the direction of the chute with the touch of a button. Learn more about the 1150 Series engine. You will notice the biggest difference is the SnowShredder serrated auger, which helps to clear heavy and wet snow when conditions are a little worse than usual. Its 14 serrated surfaces help it to chop ice and clear a lot more snow. You’ll get a snow blower capable of handling more than light snow while still being able to squeeze into more spaces due to it only being 22-inches wide, and that might be all you need if you live in a small house. Its self-propelled auger drive system will help you keep the snow blower moving forward without having to put a huge amount of effort into pushing it. The auger housing where the ball bearings live comes as one-piece to increase the time it will last before it needs fixed. Another useful feature we didn’t see on the other single-stage model was the push button electric start, and like the first 2 models we covered it will work fine up to 20 degrees below zero. Which Briggs and Stratton Snow Blower is Right for You? The reason it’s hard to decide which model to buy is because every single Briggs and Stratton snow blower is great. At the end of the day it comes down to small differences between each one, and you have to weigh up the pros and cons of each model based on your individual needs. The biggest difference is obviously single-stage versus two-stage, so you should definitely start there. Once you know which kind will suit your needs best you can take your time and focus on the features of each one. Always go for the better of the two should you be in any doubt as to which one would be best, because erring on the side of caution will stop you from having any regrets. Learn more about the history of Briggs and Stratton (PDF Document). Briggs and Stratton Small Engine Repair on their site. Snow blower engines 101 : Information by Briggs and Stratton. History of small engines from Briggs & Stratton. **If you’re looking for a great community to answer your snow blower related questions, or to share and read opinions then I recommend visiting the online Snowblower community (www.snowblowerforum.com); where you’ll find a fantastic resource filled with knowledge, advice, tips, opinions, photographs, and of course, passionate people who love snow and their snow blowers. They can help you answer your snow blower related questions. Everything you need to know about Briggs and Stratton engines. Filled with practical techniques for fixing brand new and older Briggs & Stratton engines. The Fourth Edition covers a wide range of topics to help you troubleshoot and repair your motor. Comprehensive guidance on state-of-the-art small-engine technology. As with all new editions, this book includes new information on overhead valve design (OHV); new coverage of Flo-Jet suction lift carburetion; and new information on alternators, torque limits, and bolt tightening sequences.